September 27th 2014 was a day to remember, the day that the Summerstown182 Guided Walk came of age. This was what I always hoped the walk could be, interaction and engagement on the street, people coming out of their houses to see what the fuss is about, history being relived with every step. 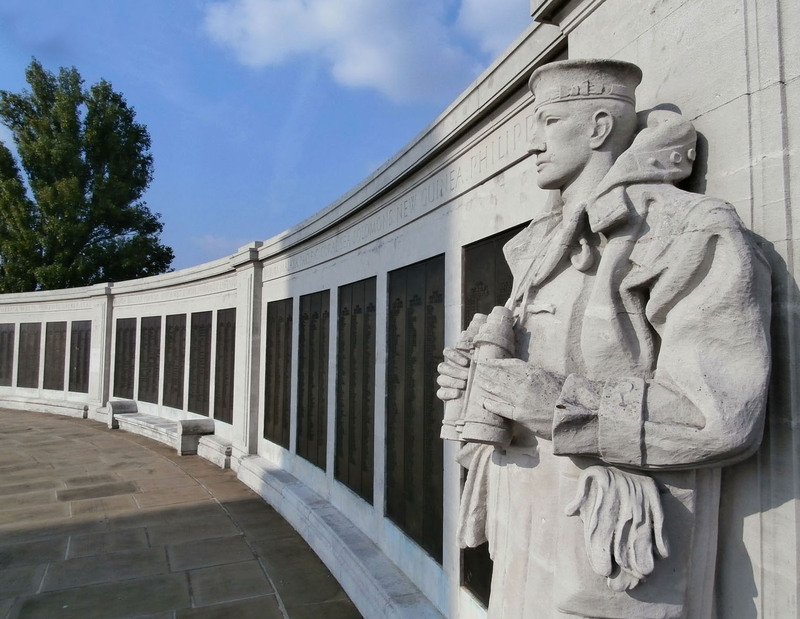 The names on our war memorial came to life that day and it won’t be for the last time. 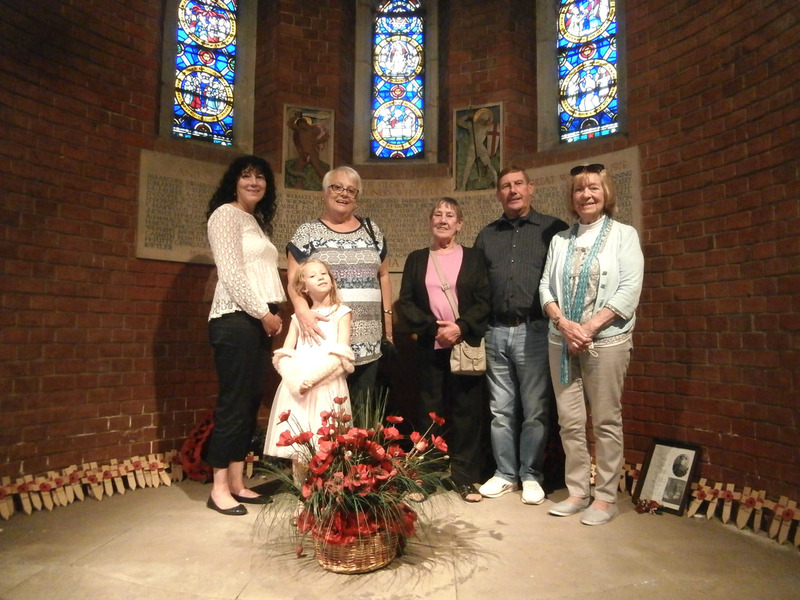 Three families who were each related to one of the Summerstown182 came to the church. Frederick Neary, William Pitts and William Clay. One of them brought along three generations. What followed was an extraordinary procession through the streets between Wimbledon and Fountain Road, streets where some of these people were born and raised, streets where one or two still have family. Roughly a third of the 182 came from this area, it is their heartland, very central to this project and worthy of celebration. 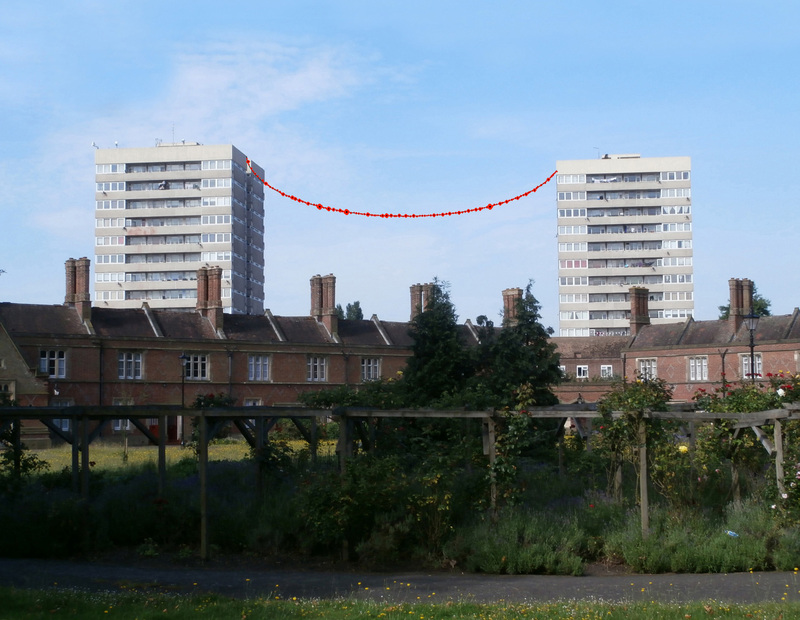 It is why we would like to one day string a ‘chain of poppies’ between the two tower blocks. Progress was slow. There seemed to be a story or a connection on every corner. People came out of their houses or downed tools in their gardens to talk to us. Leaflets were distributed, names and addresses bandied around, Sheila has a notebook full of people I need to speak to. The word is truly on the street about the Hazelhurst Road remembrance. Incredibly two of the families had a shared history at the same address. 22 Foss Road no longer exists, bulldozered away in the late sixties, it was located roughly in the middle of the area between the two tower blocks. Frederick Neary lived there in 1918 and so did his brother-in-law Thomas Holloway whose Victory Medal was clutched today by his great great granddaughter. A generation later, Maureen Giles was only a small baby when the V2 rocket pulverized many of the neighbouring houses. Her brother Ray lived there until the bulldozers came and worked as a teenage labourer on the building sites that created the concrete boxes that sprung up in the name of progress. 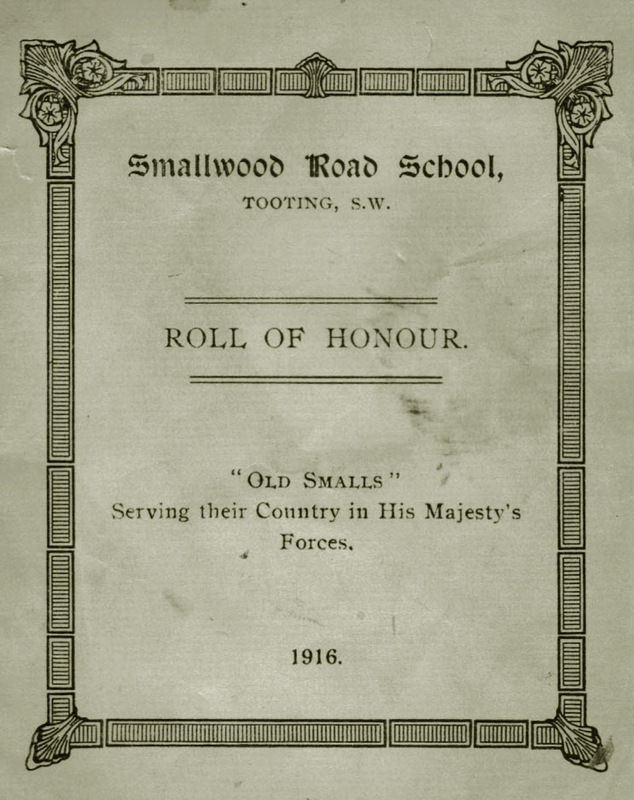 Christine pulled out the extraordinary little pamphlet that she found amongst her Mum’s belongings, a ‘Smallwood Road School Roll of Honour’ of ‘Old Smalls, serving their country in His Majesty’s Forces’ produced in 1916. There are about 450 names in here and the families eagerly searched and invariably found the names of relatives. Forty of the Summerstown182 are listed in this booklet which shows how imporant Smallwood School is to this story. A little further down the road we stood respectfully outside it and Ray recalled someone telling him how half their class disappeared on 19th November 1944. We remembered their Nan, Minnie Matilda Ware, the widow of William Pitts, killed with her daughter by that rocket and buried in Streatham Cemetery, close to the beehives, not far from Douglas Kitts. Ray recalled mention of the Gardeners and the Ackermans. We will all hopefully be back in six weeks time to remember them properly. To cap it all, we has Iris with us. All the way from Taunton, the lady whose tribute to her grandfather, William Clay started all this off. We passed 138 Smallwood Road where she was born. The VE Day street party photo came out and it seems like a relative of anyone who has ever walked the Summerstown streets was in attendance that day and in this picture. Talk of daffodils, pigeons and watercress beds, the things that made Summerstown great, turned to tales of dodgy geezers, jail-breaks and cash stuffed under the carpet. The fly-by-night Paraffin Park evoked by Alfred Hurley. We finished off with an assessment of the strange raised humps on a patch of grass behind Newbridge Court at the top end of Hazelhust Road. Could this be the location of the air raid shelters which were empty on the morning of Novembr 19th? Certainly not the best surface for a game of football. Had we witnessed a troupe of albino squirrels prancing across these, the day couldn’t have been any better. The next Summerstown182 Walk will be on Saturday 8th November at 2pm, there will be another one on Saturday 6th December. Close to the seventieth anniversary of this incident, a service to remember the victims of the Hazelhurst Road V2 bomb will be held at 1030am on Sunday 16th November at St Mary’s Church, London SW17. Afterwards there will be a gathering in front of Smallwood School, close to where the bomb fell. It was a most glorious middle-Autumn day for a trip to the Medway. The date of 22nd September has taken on a new significance and it felt right that we should be making this journey down the estuary to a spot which excactly one hundred years ago, was engulfed with shock and grief. 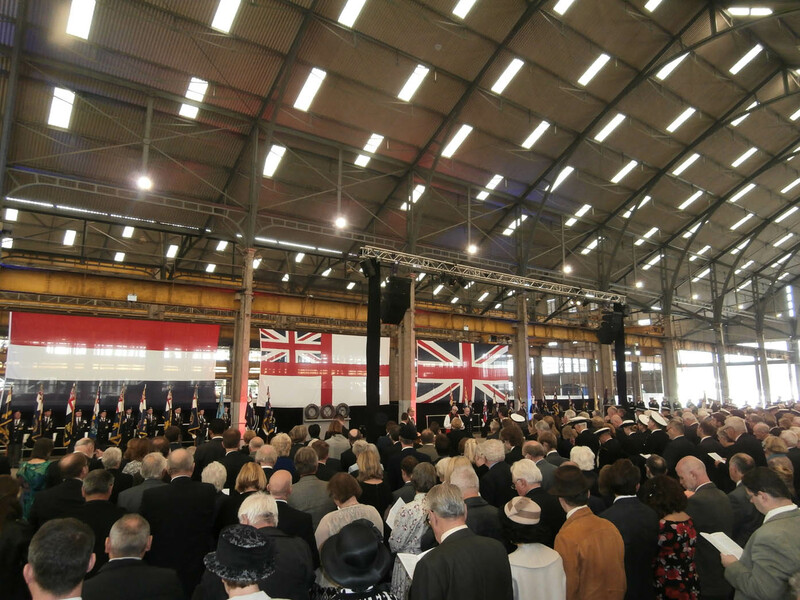 A century after the event, hundreds of people were coming together at the Royal Dockyard in Chatham to remember the incident which involved their ancestors, people none of them could ever have met. Our only connection to Thomas Lindsay Kirkland is that he once lived a few streets away from us. We have discovered very little about him but he is the first of 182 names on our war memorial to be lost during the war and it seemed right to be honouring his memory. He perished along with 1,459 others when three cruisers; The Hogue, The Cressy and The Aboukir were sunk by a submarine off the Hook of Holland. They have become collectively known as the Live Bait Squadron. Thomas’ home on Franche Court Road with its white picket fence and rosemary hedge has become a pivotal story-telling point on our Summerstown182 walk. Last weekend, for the first time I made a connection with the people who lived there, one of whom later came to the church to get a photo of the memorial. Until we researched Thomas Kirkland’s story I knew nothing about this incident and can only marvel at what Henk van der Linden and others over the years have done to keep the story alive. On Monday it was more alive than ever. The commemoration event in Chatham was a wonderful tribute to the lost seaman, about 1,200 of whom came from the Chatham-Medway area. Many were very young. There was also strong Dutch participation honouring the part played by the Netherlands at the time, in terms of acts of rescue and in recent times in terms of preserving memories. The service was in the immense hanger-like ‘No5 Covered Slip’ where they have been making ships since the early 1800s. Three huge flags provided the backdrop, the Royal Marines Band, the British Legion standard bearers, the braid, the dignity – it could not have been a more splendid tribute. We were proud to be there, humbled to represent our Petty Officer from HMS Hogue. 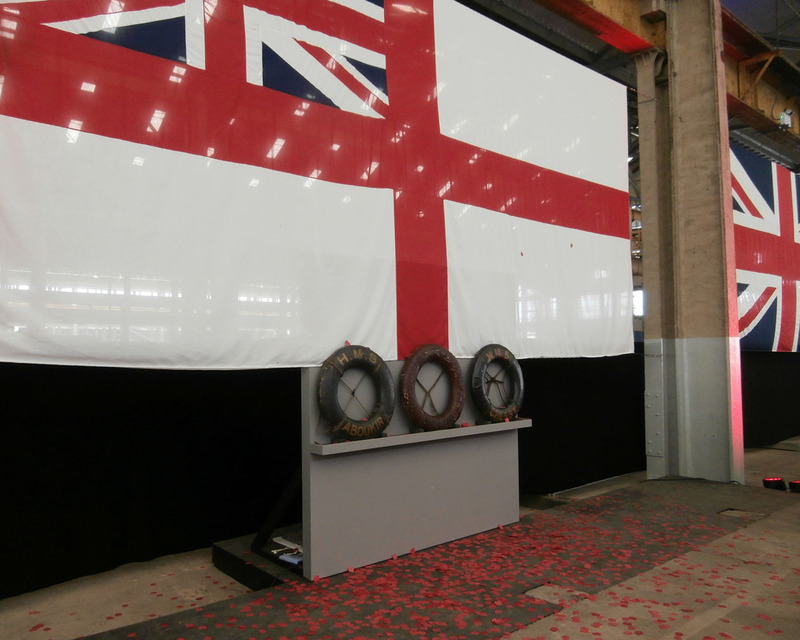 The service concluded with a shower of poppy petals which tumbled gently onto three life buoys place in front of a gigantic Royal Ensign. HMS Cressy, HMS Hogue, HMS Aboukir. They were the genuine article, all recovered that fateful day and now preserved in the Imperial War Museum. Shivers ran down my spine imagining these in the water, perhaps with someone clinging to them on that September morning. After the Dockyard we tried to find the monument high above the town, the Chatham Naval Memorial on which are inscribed the names of over 18,000 seamen killed in both wars. It was breathtaking. We set about finding the names of our six boys, one of whom quite literally was a ‘Boy’ Percy Newman, a sixteen year old butler’s son from Garratt Lane, one of 820 drowned on HMS Defence in the Battle of Jutland. The names are in chronological order so it was a simple task. Stoker First Class Harold Glassett from 29 Keble Street who died on a submarine is very appropriately on panel 29. Leading Signalman William Pavitt from Merton Road lost his life on HMS Derwent. Chief Petty Officer Francis Halliday, the schoolkeeper from Smallwood Road, went down with all hands on HMS Clan McNaughton. Alfred Byatt, Stoker First Class from Foss Road was drowned on HMS Formidable off the Dorset coast. On the way to the dockyard we passed through Rochester and wanted to pay our respects to another sixteen year old we know something about, Henry Ollive from Bellew Street. He is buried in Fort Pitt Military Ceremony and had been visited earlier in the summer by Simon on his way to track down ‘I Clay’. Although its a small graveyard we couldn’t find a map. We were in a bit of a rush for the ceremony but fortunately got a bit of help in locating the grave. Just as we were getting out of the car, a white fluffy creature darted from the direction of Henry’s grave and ran behind a clump of conifers. As we wandered over, the helpful critter emerged and cooly proceeded to observe us from a distance, just to make sure we’d got the message. 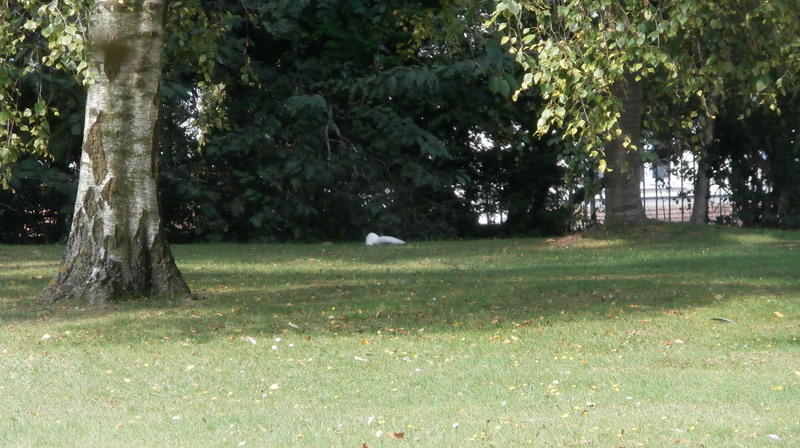 If only the extraordinary albino squirrel guide of Fort Pitt had been at Etaples to help point out George Henry Worth. One of five Smiths in the ranks of the Summerstown182, Charles Arthur Smith is tucked in close to William Nicholls in the corner of Streatham Cemetery. Roughly the same age as William’s eldest sons, its as if the older man is keeping a watchful eye on the eighteen year old naval rating. The son of Charles and Louisa Smith from 55 Lucien Road, his home was quite a distance from Summerstown, on the far side of Tooting on the edge of the Totterdown Fields estate. Close to Tooting Bec Common and the Lido. His father was a coachman and the family of four children lived for the first decade of the century at the quaintly named 10 Goodman’s Stile, Whitechapel, just off the Commercial Road right in the heart of Jack the Ripper territory in the east end of London. They probably moved to Tooting around 1912. His headstone with prominent anchor and rope motif, carries an intruiging personal message at the bottom ‘His memory is as dear today as in the hour he passed away, our Bobs’. It indicates that he was an ‘Ordinary Seaman’ in the Royal Naval Volunter Reserve. The words HMS “Victory” suggest that he went down on a mighty warship on 9th October 1918. 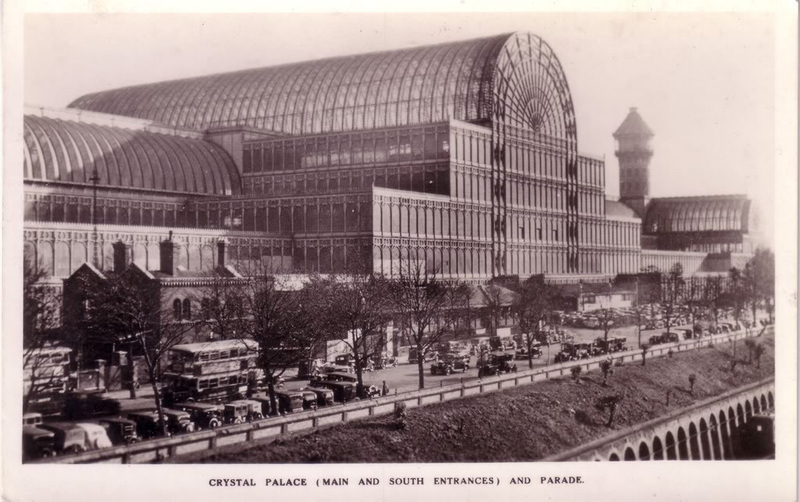 In fact he died of illness a few miles down the road at Crystal Palace. 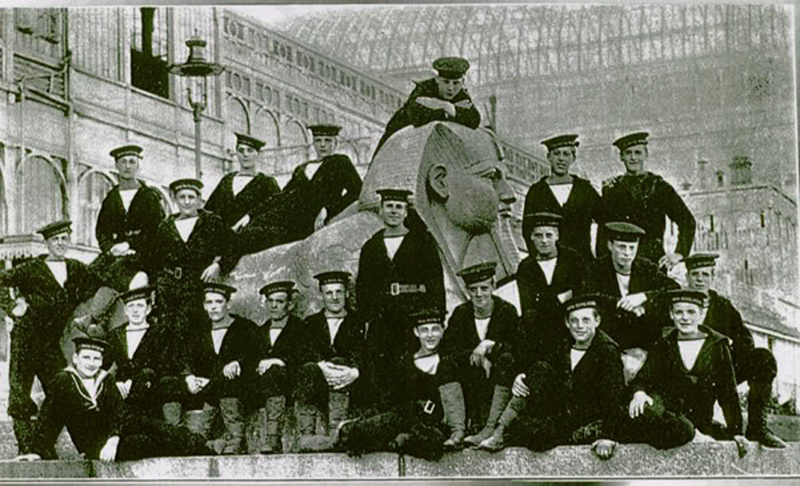 HMS Victory was the name given to a number of naval training establishments and due to its location this one was informally known as HMS Crystal Palace. The original building, constructed for the Great Exhibition in Hyde Park in 1851 was a symbol of the power and prestige of the British Empire. Three years later it was moved at immense cost to an affluent part of south London near Sydenham Hill and the area was soon named after it. The great glass structure, at the time the largest amount of glass ever seen in a single building was destroyed by fire in 1936. After the war, it was even for a while the original location of the Imperial War Museum. Between 1914 and 1918 more than 125,000 men trained there and it must have been a very exciting place for the young Charles Smith. It is very likely that he died of what was known as ‘spanish flu’, as on that day, just a month before the end of the war, he was one of ten seamen, all of the same rank to die of ‘illness’ at the Crystal Palace depot. This was the early phase of an extraordinary epidemic that in the years 1918-1919 would kill three times the number of people who perished in the war, roughly fifty million people worldwide. It was most deadly for people between the ages of twenty and forty. The First World War with its mass movements of men in armies and aboard ships, most certainly aided in its spread. Death came almost instantaneously and without warning. A tickly throat in the morning, could be followed by ones skin turning purple and death by choking before bedtime. There was great panic at this virus and the authorities already paralysed by four years of war seemed unable to know how to handle it. Typically they tried to play it down. In desperation people tried their own homemade prevention remedies; eating raw onions, keeping a potato in their pocket, or wearing a bag of camphor around the neck. There are about twenty other CWGC headstones in this area of Streatham Cemetery with date of deaths long after hostilities ceased. Close by are the Gawn brothers originally from Bickley Street in Tooting who died of pneumonia on successive days. 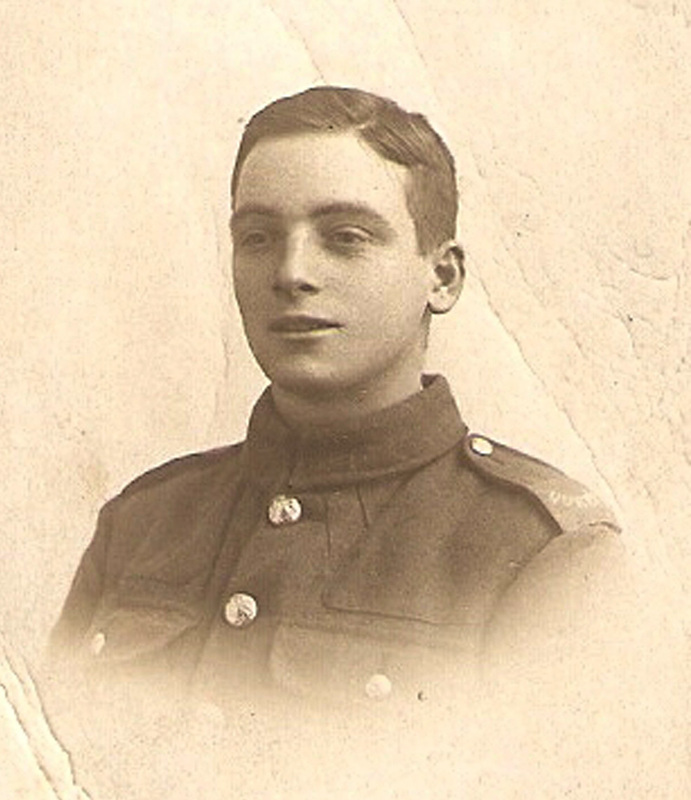 Gunner Mizen from Thrale Road died of meningitis. 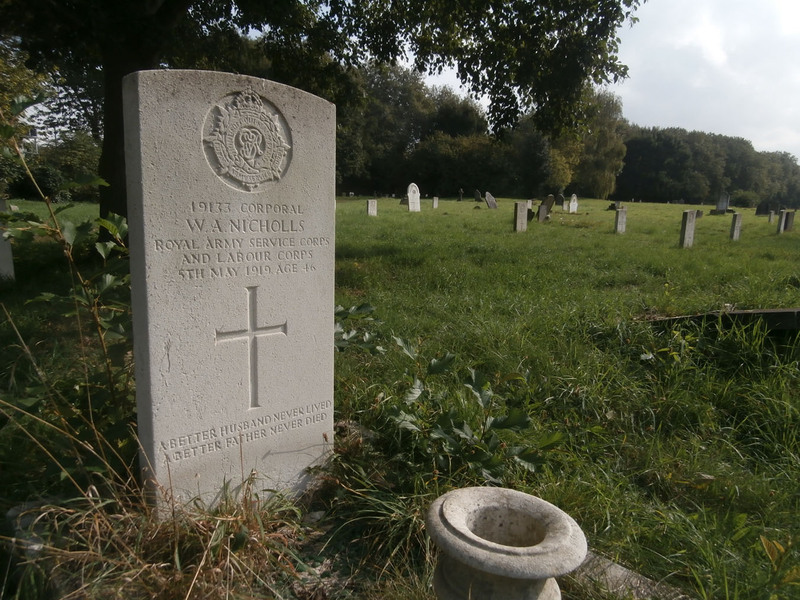 Private Nicholl from Clapham died of pneumonia. Lance Corporal Greaves from Battersea died of nephritis. And so it goes on. At least they all have headstones or formal recognition on the memorial wall. 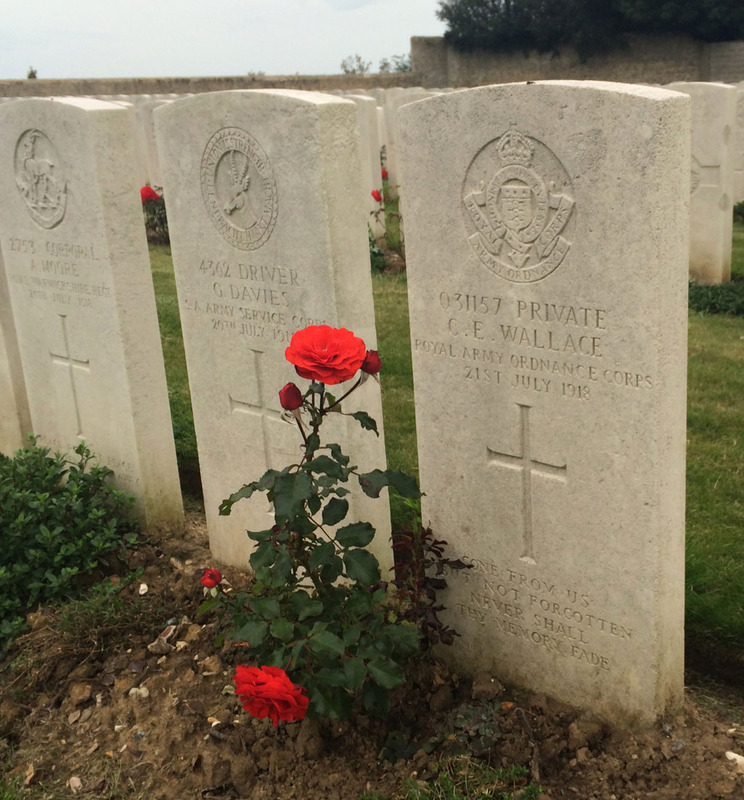 Spare a thought for the Mace brothers, Arthur and William from Thurso Street, two young men who between them gave over three years service to regiments of the British army in the First World War. Both were discharged and died some time later of tuberculosis. They are buried in unmarked graves. 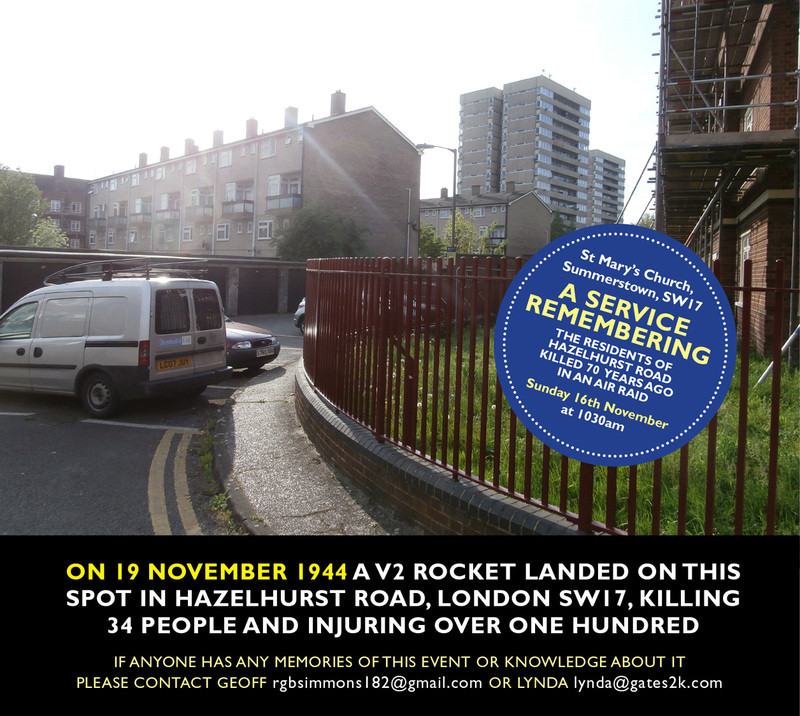 This autumn marks the seventieth anniversary of the V2 rocket attack on Hazelhurst Road which killed 34 people. What does any of that have to do with the Summerstown182? Well, when the twelve ton weapon of devastation dropped out of the sky on a Sunday morning as people were opening their curtains and thinking about breakfast, it struck a savage blow into the Summerstown182 heartland, as assuredly as if someone had taken a sledgehammer to the war memorial. Six of the fifty houses destroyed were homes in which members of the 182 lived, at least two of their relatives were among the dead. The bomb even had the effrontery to pulverize one of them’s war medals. The gaps in the above map show where those houses should have been. 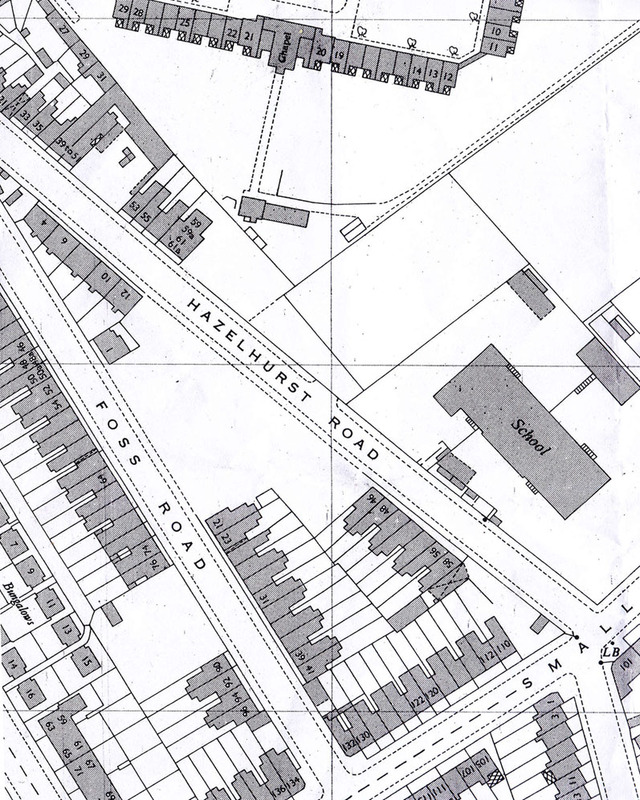 Thirteen of the Summerstown182 lived on Hazelhurst Road and seven came from Foss Road, where in 1918 there were 92 men serving out of 137 dwellings. Frederick Neary was one of those registered to cast his vote for the first time in December 1918. He never made it to the polling booth and was killed in action on 11th August. There were two other soldiers resident at No22, William Holloway, Frederick’s brother-in-law and Lionel Wilmott. The house was in a pivotal position at the apex of the point where Hazelhurst and Foss Roads met to form one grand avenue leading to St Mary’s Church. I would estimate that it would have been situated roughly halfway between the twin towers of Chillingford and Hayes End House. In 1944 it was home to one year old Maureen Gates who fifty years later ordered replacements for those pulverised medals which belonged to her Grandfather, William Pitts. Frederick Neary was born in Bermondsey in January 1899, the son of Richard and Lenora. His father was born in Belgaum, not far from Goa in southern India in 1863. This was a time of great upheavel in a country still under British control. Following the revolt of 1857 there were 62,000 British troops in India the year he was born and Richard was the son of a Paymaster Sergeant in the 44th Foot Regiment. In 1901 the family were in Southwark but by 1911 they had moved to 31 Hazelhurst Road. This was an odd location, tucked around the back of the east side of the street fronting the Diprose Lodge almshouses. It stood roughly on the end of the block on the right of the above photo. The 1911 census record offers a fascinating glimpse into the family. Richard worked as a furniture removal man and porter. Frederick, then twelve was the second youngest of four children with a brother and two sisters. A few weeks ago I was contacted by Wendy Taylor living in Kent. She is the granddaughter of one of those sisters, Dora. Wendy very kindly shared a wonderful photograph of her Great Uncle. A picture that has been in the family for almost 95 years, an older sister’s cherished memory of a younger brother, a handsome nineteen year old, pristine in his uniform, forever frozen in time. Back in 1911 Dora was eighteen and working as a laundry maid, in the steam section. She married William Holloway in Wandsworth in 1917, their daughter Dorothy was Wendy’s mother. Dora died in 1965. Richard, a year younger than Dora was a servant in the Royal Automobile Club. A note in the St Mary’s parish magazine in 1916 indicates that he joined the 2nd Canadian Contingent. Richard survived the war but died aged 51 in 1945. Lillie aged ten, like Frederick was still at school and passed away in 1973. There was also a lodger at No31, so seven people were living in a four-room cottage. Frederick Neary enlisted in Kingston and ended up in the 8th Battalion of the Lincolnshire Regiment. He was killed in action on 11th August 1918. His burial place at St Amand, roughly half way between Arras and Amiens suggests that he died in one of the great battles of the final advance. The battle of Amiens which began on 8th August was the opening phase of an attack which became known as the Hundred Days Offensive and ultimately lead to the end of the First World War. Allied forces advanced over seven miles on that first day, the greatest territorial gain in a single day on the western front. The German General, Erich Ludendorff described it as ‘the black day of the German Army in this war’. Its unclear when Frederick actually arrived in France but he most certainly played his part in this response to the German Spring Offensive. Wendy told me that after seeing her Great Uncle’s name on the Summerstown182 website and contacting us she spoke to her Dad. He recalled that when her Grandad, William Holloway was coming off the front line, he bumped into Frederick who was going the other way. They had a chat and he was without doubt the last person in the family to see him alive. Many thanks to Wendy Taylor for letting us use this photograph and providing information about her family. There will be a seventieth anniversary service remembering the victims of the Hazelhurst Road bombing at St Mary’s Church on 16th November at 1030am. Its a real honour to be asked to give a First World War themed walk around Streatham Cemetery on the Friends’ Open Day. Looking for the Maces in the spring, I spent quite a bit of time in there so any excuse to go back into this oasis of tranquility is most appreciated. 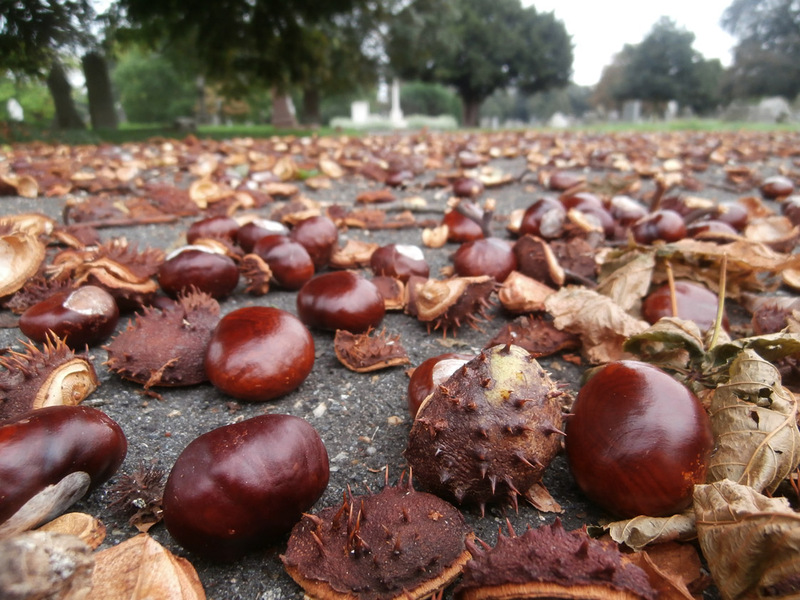 Especially at this glorious time of year with beechnuts crackling underfoot and conkers tumbling out of the trees. On a sparkling morning in mid-September, Doug Kitts was keeping a watchful eye on the bee hives, Ted Foster was twinkling in the bright autumnal sunshine and William Mace’s holly bush had burst into berry. It was also an opportunity to familiarise myself with William Albert Nicholls from 7 Summerstown. His house is pictured in the above photo taken in 1955, on the left next to the shop. Now the space is occupied by a carpet warehouse. So many of the Summerstown182 ended up alone in a corner of a foreign field, but William is about half a mile from his home, tucked up cosy with his wife Alice Harriet and an easy visit for any of his nine children. The inscription on his grave sums it up ‘A better husband never lived, a better father never died’. He was 46 and the date of his death, 5th May 1919 seems unusual, six months after the Armistice. William almost certainly got sick or died as a result of an accident. The burial register often gives a clue and a hospital is sometimes mentioned, but not in this case. He may even have died at home. Born in Ware, Hertfordshire in 1873, he was one of ten children of Thomas and Selina Nicholls. They moved to Croydon but in 1886, both of William’s parents were to perish in a terrible accident at a bakery in 157 Abbey Street, Bermondsey, run by his older brother, Thomas. They died of their injuries in Guy’s Hospital and two of William’s sisters, Caroline and Beatrice were seriously hurt jumping from the flames. Under ‘Fatal Fire at Bermondsey’ an account in The Daily News recalls how ‘The occupier and his brother William, a lad of thirteen or fourteen years, made their escape from the first floor back window on to the adjoining house in Gedling Street. Much consternation was created in the neighbourhood’. The effect this tragedy had on the young man is hard to imagine. William worked for a while as a painter then, perhaps in some way to put the disaster out of his mind, he joined the Queens West Surrey Regiment at Guildford in 1890. What followed was a chequered ten year career in the army. Promotion to corporal and the passing of exams was followed by court martial and demotion to the ranks. He saw something of the world though, Malta, South Africa and India. Ferozepore being just one of the places that he passed through, later the resting place of a fellow member of the Summerstown182, Reginald Knight from Squarey Street. His service record indicates that in 1900 William was discharged as ‘medically unfit for further service’. Funnily enough his namesake from Huntspill Street, William Nichols ‘with a single L’ received similar news. Both would be undeterred. Meanwhile William had married Alice Savill in Croydon in 1897. By 1901 they were living in Westminster with two small boys. A few years later, the young family were part of the central London slum clearance scheme to the green spaces of Summerstown. In 1911 William was living with his wife and seven children in four rooms at 7 Summerstown, opposite Bob Sadler’s cottage and next door to what is now the Conservative Club. Very handy for a pint in The Corner Pin. Two more children were born after this, a family of five girls and four boys. He was working as a lift engineer’s labourer but if he thought life was going to get any easier, the shadows were closing in. With his large family, age and previous discharge, William would very likely have avoided military involvement in the First World War. But he joined the Army Service Corps in 1915 and entered France on 30th October 1915, in the aftermath of the terrible Battle of Loos. The 1918 absent voters list shows that his two eldest sons, Thomas and Frederick had also joined up. William was now 42 and probably considered still not in great shape for front-line duty. At some stage he transfered to the Labour Corps under the rank of Corporal. This was the huge group of men tasked with the labouring work required to keep the wheels of a huge army turning. Many of them were from India, China and elsewhere, but others were skilled with picks and shovels or some kind of trade. Then there were those who had been injured or wounded and deemed unlikely to be much use in combat. It was still highly dangerous work and in the German Spring Offensive emergency of 1918, many in the Labour Corps would have rejoined the infantry. When the war finished, one of the tasks assigned them was ‘burying the dead’. Its easy to see how such work could make someone sick or diseased, not to mention the influenza epidemic of the time. A date on his medal card of 8th February 1919 suggests that William Nicholls was perhaps discharged on this date and spent his last few months in England before his death on 5th May 1919. With nine siblings and nine children of his own, there is a very good chance that descendants of William Nicholls are still around. That may even be one of them walking past the carpet place? You never know, stranger things have happened. Many thanks to Marion Gower who researched this soldier and provided much of the information for this story. 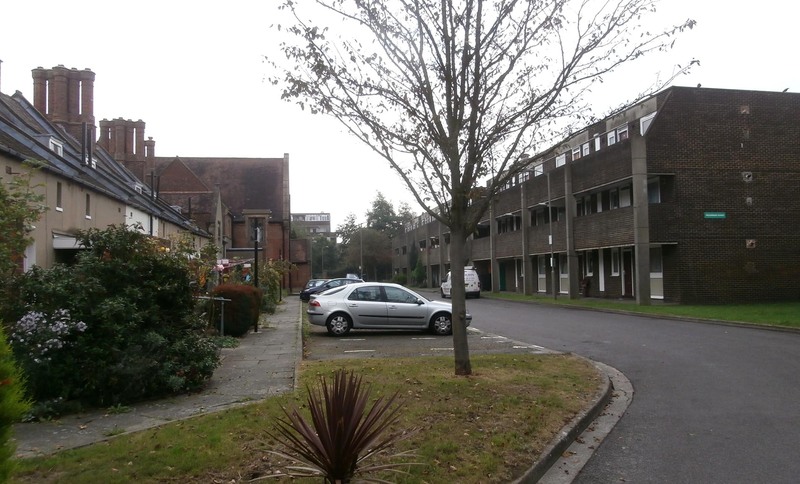 It took some time to connect James Luke Tugwell to Summerstown. The eldest son of bricklayer William Tugwell and his wife Rachel, he was born on 14th June 1886 in Kingswood, near Tadworth, tucked between the Surrey Hills, just inside the M25 orbital, south of London. 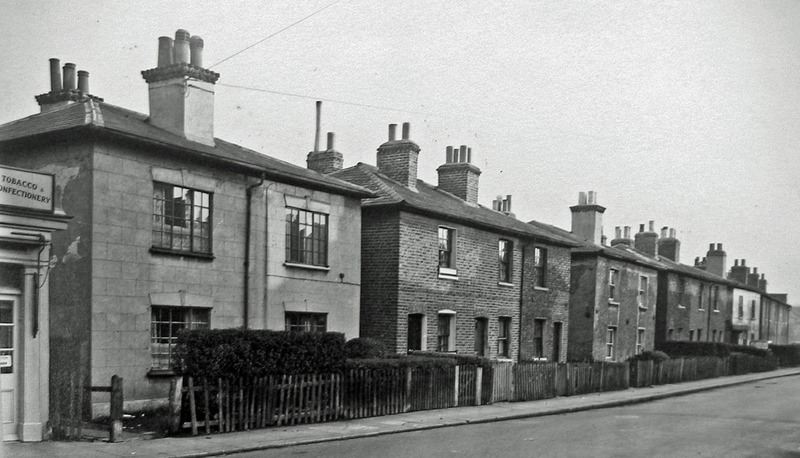 In 1911 the family were living in Fern Cottages, Ferndale Road, Banstead. Five of the eight children in the household were adults and still living at home, so it must have been quite a squeeze. At twenty four, James was the eldest and working as a labourer. He had four brothers and three sisters, two of these Ellen and Caroline were domestic servants. James’ service record notes that he lived in Sutton and certainly leaving the nest and moving there would have brought him closer to Summerstown and a meeting with Lilian Hake. 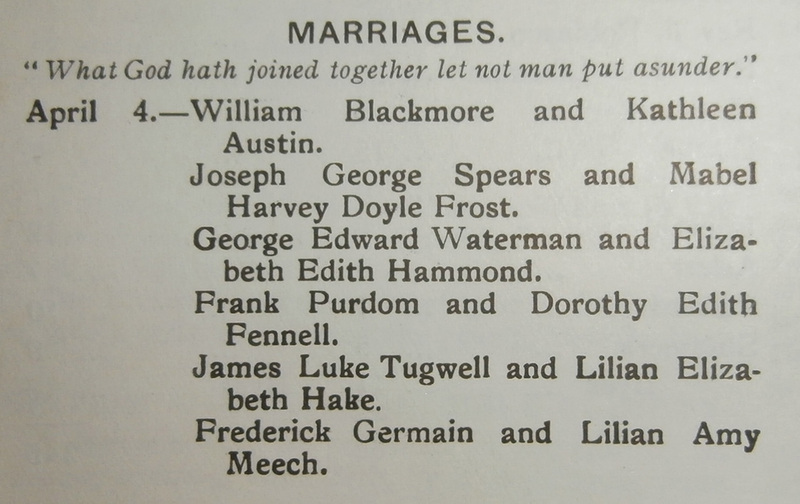 Along with five other happy couples, James and Lilian were married on 4th April 1915 at St Mary’s Church. She was the eldest of six children of the evocatively-named Abraham Hake of 21 Headworth Road who was a house painter. In 1911 Lily was working as an ironer in one of the local laundries. James is listed on his marriage certificate as a gas worker. Whether he enlisted voluntarily or was conscripted, he joined the army at Kingston and ended up serving with the 7th Battalion of the Cameronians (Scottish Rifles). The absent voters list of 1918 shows that there were 46 serving soldiers from Headworth Road and that Abraham was a Corporal in the Army Sevice Corps and his older son William were serving with the East Surreys. James’ service would take him to the Middle East and the fight against the forces of the Turkish Empire. Just eighteen months after walking down the aisle in St Mary’s, James Luke Tugwell, the man with the biblical name was killed in action in the Holy Land and is buried in Gaza. Of all the quiet peaceful places that some of these soldiers and sailors lie at rest, Gaza War Cemetery stands out as a place still fraught with danger to this very day. Whilst all is quiet on the western front and the fields of Flanders, the bombs still occasionally rain down on Gaza. James Tugwell’s date of death on 2nd November 1917 marks him down as a casualty of the Third Battle of Gaza. The key western point of the Turkish defensive line, two previous assaults on Gaza City earlier that year had ended in failure. Crucially this time ‘Lawrence of Arabia’ and Field Marshal Edmund Allenby were on board. 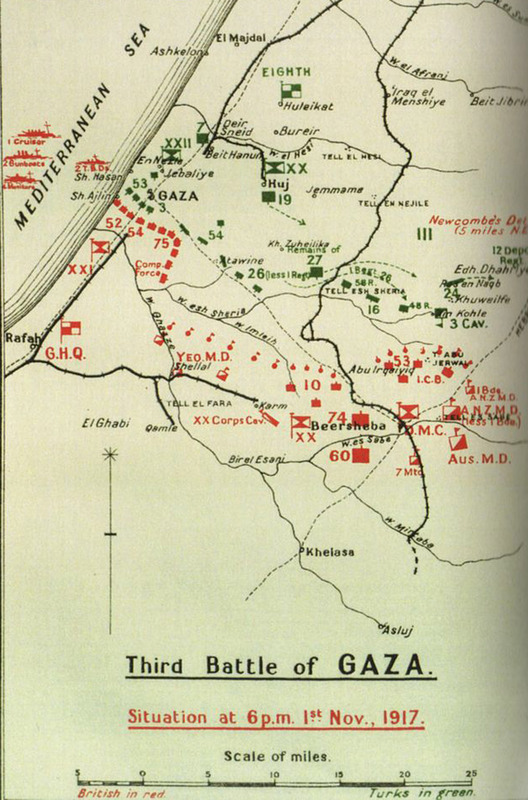 Allenby attacked Beersheba on 31st October with a force of 40,000 men and the next day turned his attention onto Gaza. By 6th the Turks were in retreat. The seizure of Gaza and Beersheba opened the way for Allenby to give British Prime Minister, David Lloyd-George his ‘Christmas present’ of Jerusalem. Mindful of the sensitivities involved, on 11th December Allenby entered the city through the Jaffa Gate, very respectfully on foot rather than horseback. Just a few months later as the Turks fought to get it back, two other Summerstown lads, Horace Woodley and Walter Tappin would also lose their lives. 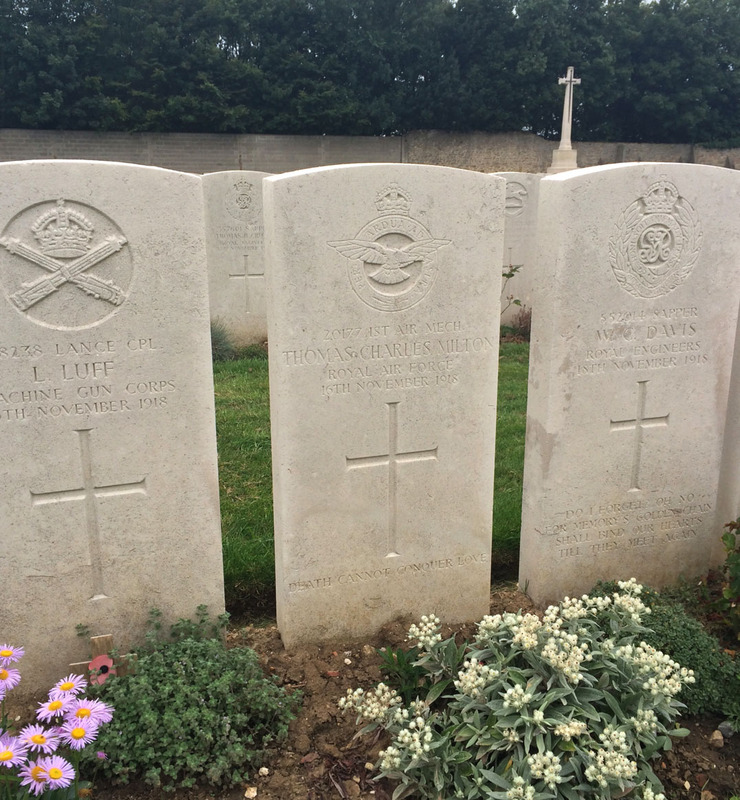 Three of the Summerstown182, one in an english regiment, one in a scottish one and one in a welsh regiment, lie far from home in middle east graves. They were fighting to protect British interests being threatened by the Turkish Empire; the Suez Canal, the Persian oilfields and the Shatt-al-Arab waterway. Trying to find a little more about what the Cameronians were doing in Gaza, the date of 2nd November 1917 seemed to point towards an action at a spot on the high ground just south of the city named Umbrella Hill. A newspaper cutting preserved in the archive of the South Lanarkshire Museum confirms this. The language is feisty stuff. 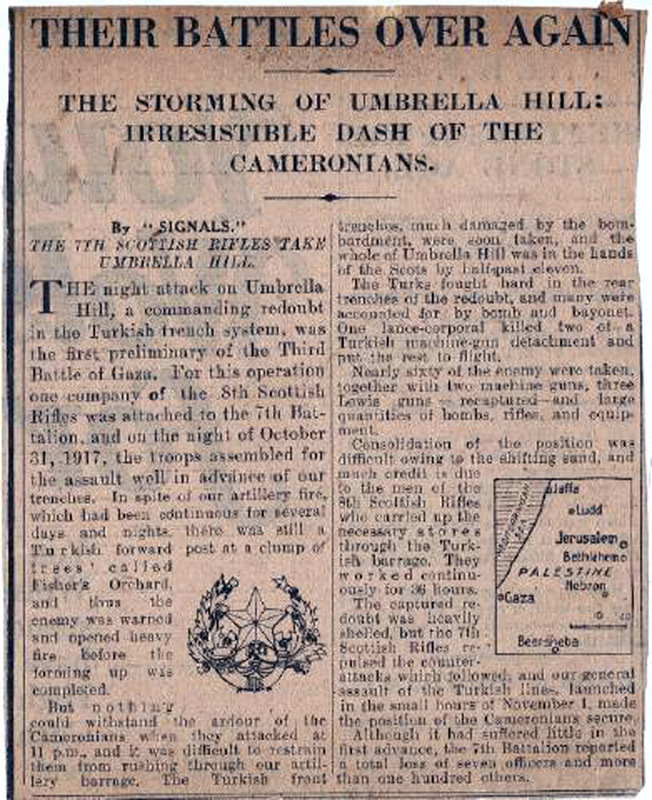 Headlined ‘The storming of Umbrella Hill: Irresistable dash of the Cameronians’ it outlines a heroic night attack in which the hill was taken in half an hour ‘with many of the Turks accounted for with bomb and bayonet’. Typically the bad news is buried in the last sentence ‘Although it had suffered little in the first advance, the 7th battalion reported a total loss of seven officers and more than one hundred others’. One of those others was more than likely James Luke Tugwell. 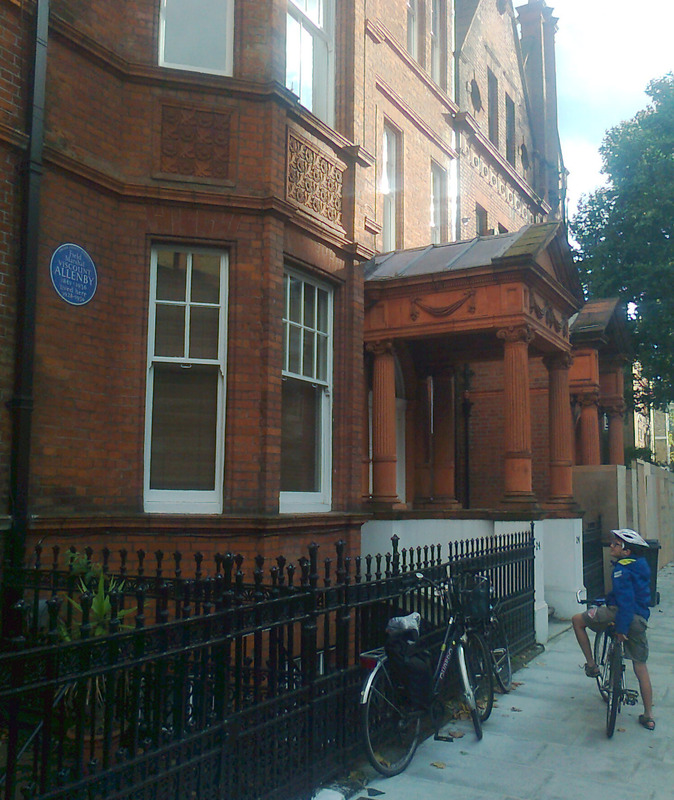 Quite by chance I was cycling back from Hyde Park in the summer and glanced up at a blue plaque in Wetherby Gardens, South Kensington. It was the grand home where Edmund Allenby spent the last ten years of his life. There’s no hope of one of those at 21 Headworth Road. 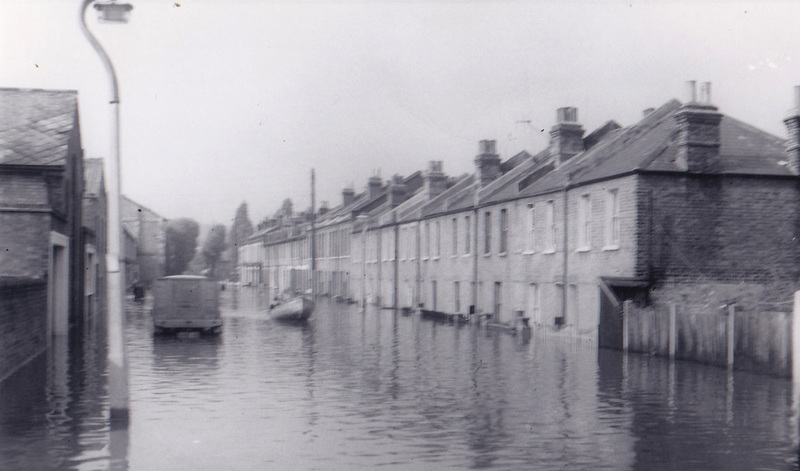 After the floods in May 1968 the residents had to vacate and it disappeared under the Burtop Road Estate in 1970. Many thanks to Alan Gardner for this photograph. 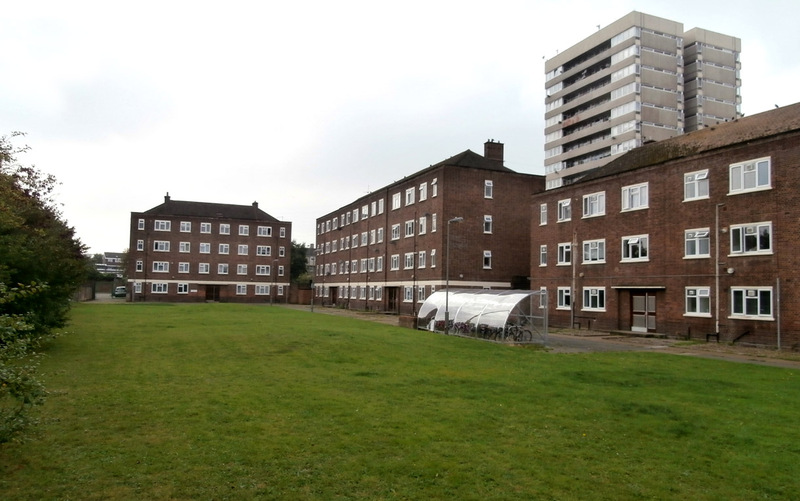 Three of the Summerstown182 lie in a foreign field that is is closer to home than most. Its about two hours on the ferry or a 25 mile swim across La Manche (if you are David Walliams) to Boulogne-sur-Mer. Though in fact there is no ferry service at present and the town has unfortunately seen some decline since the Channel Tunnel opened for business. Just a few miles outside it and folded into the hills on its northern edge is Terlincthun British Cemetery. Here lie; Claud Edgar Wallace from 19 Foss Road, William Parker from 18 Huntspill Street and Thomas Milton, the Balloon Man from 25, Summerstown. How they all came to be in this unusual place is hard to explain, indeed two of them died after hostilities had ceased. A post about Thomas Milton who succumbed to influenza is in the January archive of this website. 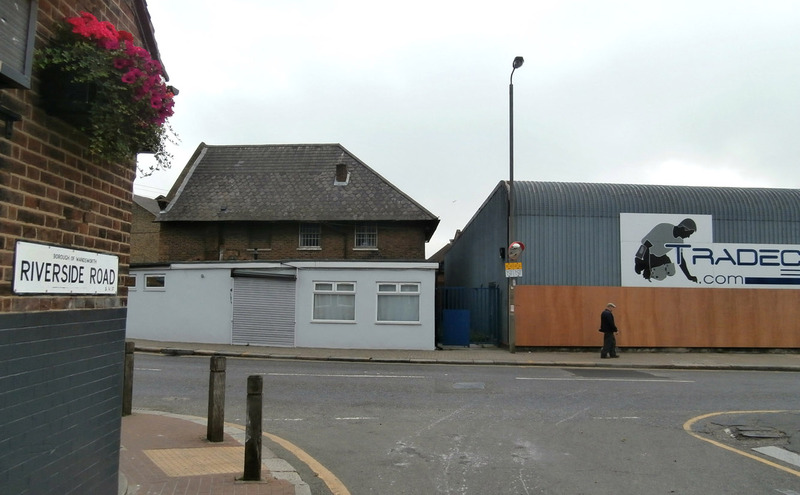 The site of his home, overlooking Wimbledon Stadium car-park is now the location of By the Horns micro-brewery. William Parker was only nineteen and his date of death was tragically four months after the Armistice, on 10th March 1919. Serving in the 17th Battalion of the London Regiment, his death can only have been as a result of accident or illness. Certainly Boulogne and this particular area called Wimereux was the location of many hospitals and other medical establishments. William would only have been 14 when war broke out so hopefully he only saw service in its later stages. He may well have been with his regiment in Egypt before arriving in France in June 1918. He lived just three doors away from William Nicholls at No15 Huntspill Street, the man who was discharged as being ‘unlikely to make a good soldier’ but went on to join another regiment and served for four years. He was lost in the furious German Spring Offensive and William Parker would have been thrust into the response to this, the Battle of Amiens, which turned the tide of the war but at immense cost. There is no record of William on the 1918 Absent Voters List – he was still too young to have a vote. Claud Edgar Wallace is on the list at 19 Foss Road though like a great many others he never got to cast his vote in the ground-breaking election that December. He was killed on 21st July 1918. 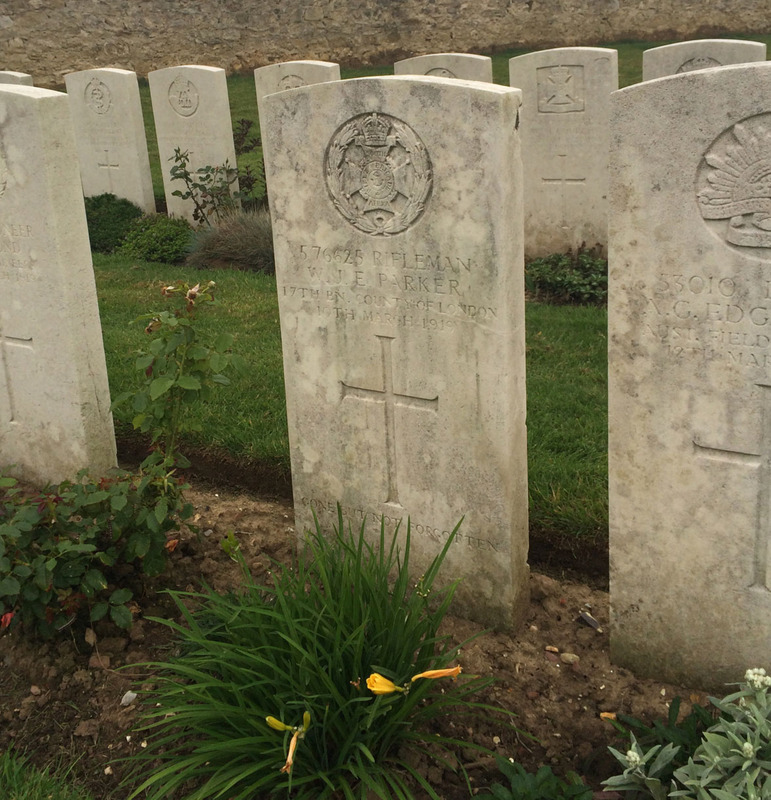 The 34 year old served in the 4th Company of the Army Ordnance Corps and like so many others who had been injured, was probably taken to Boulogne that summer but never made it any further. My Great Uncle passed through it three times on his way back to hospital in England but Claude Edgar Wallace was not so fortunate. On the day we visited the cemetery a beautiful vibrant red rose was sprouting directly in front of his grave, lighting up a dull day. The son of Thomas and Emma Wallace, Edgar was like his father, a tailor by profession. One of the many responsibilities of the Army Ordnance Corps was clothing and uniform, so very possibly his army service allowed him to utilise his working skills. 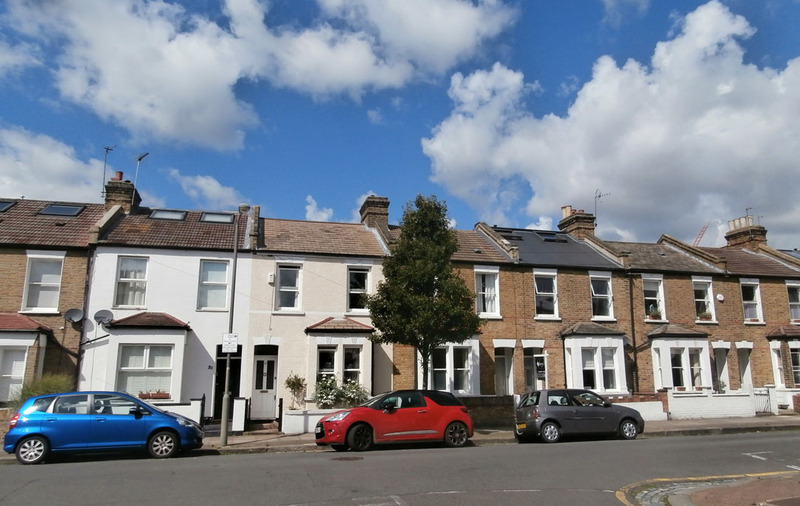 Raised in Fulham, he married in 1907 and was living with his wife Sarah and two small children, Frank and Ivy in three rooms at 47 Fernthorpe Road, Streatham in 1911. At some stage the family moved to Foss Road in Summerstown and clearly shared No19 with another household, as according to the Absent Voters List, a serving Royal Marine, Charles Robert Errett was resident there in 1918. 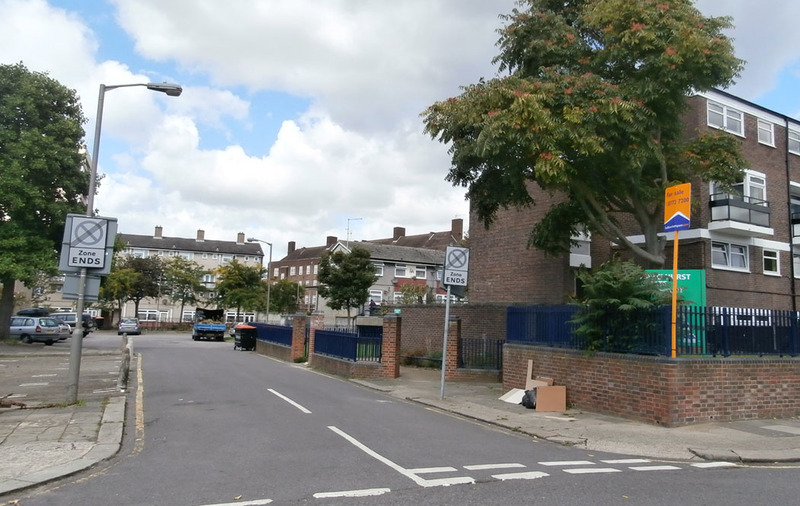 On the east side of the street, this was one of the houses destroyed in the 1944 V2 rocket attack and the road which once ran all the way from Smallwood to Wimbledon Road has now been chopped in half by the Hazelhurst Estate. The house would have been roughly where the truck is in the above photo. What a contribution to the First World War it made though, because out of those ninety six dwellings came ninety two soldiers – though probably double-up that number to include those like William Parker who weren’t yet twenty one or the Dell brothers who were already killed. 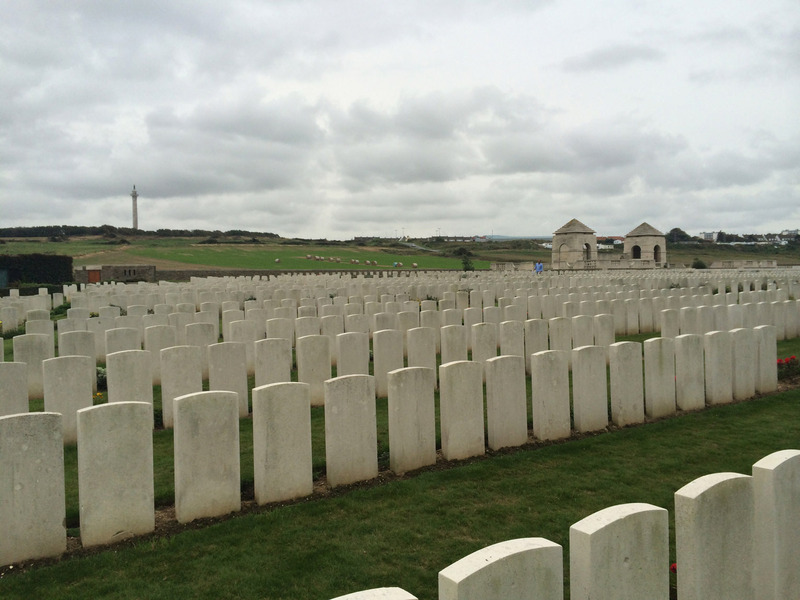 The cemetery at Wimereux is overlooked from the top of a nearby hill by an imposing memorial which would appear to be a French version of Nelson’s Column. The fifty three metre high Column of the Grande Armée topped off with a statue of Napoleon in military dress, marks the location of the base camp known as Camp du Boulogne, where Napoleon amassed France’s biggest ever army of eighty thousand men. From here they poised to invade England between 1803 and 1805. Construction began in 1804 and completion took a hundred years. Amazingly it survived both wars and particularly intensive fighting around the area in 1940 and 1944. Now the only invading army are the refugees and asylum seekers. Just a few miles up the coast at Sangatte and Calais, young men, many from countries ripped apart by war and persecution risk their lives every night jumping aboard trucks and beneath trains trying to make it into the UK. Scared and desperate, chancing their arm in search of a better life, who could say they are not unlike the many thousands who came the other way a century ago.